The second of our three big CREWS project conferences took place recently: Exploring the Social and Cultural Contexts of Historic Writing Systems (14th-16th March 2019, see here for programme). I had been excited about it for a long time, but when it came I was absolutely blown away by the quality of the presentations and the new things I learned and the ways it has developed my thinking on writing practices. I’m going to use this blog post to try to pass on some of what I learned by telling you about themes that kept turning up over the three days, even in papers on completely different topics. The object we are looking at this week from our special display at the Fitzwilliam Museum is a fragment of an Egyptian coffin from the early Middle Kingdom (c. 2055 — c. 1985 BCE), possibly from Asyut. The coffin fragment is painted with yellow earth on the outside, but inscribed with hieroglyphs on the inside. This week we are having a closer look at the smallest object in our special CREWS-themed display at the Fitzwilliam Museum, a tiny seal stone made of green jasper and featuring signs of the Cretan Hieroglyphic script. At just 1.4 by 1.1 cm, and dating to the 19th-17th centuries BC, it is a minute but fascinating testament to the earliest writing system attested in ancient Crete. The next item in our CREWS display series takes us back to Roman Egypt, where the co-existence of different languages had important ramifications for writing. The CREWS project Twitter feed has gone Lego crazy today, as you may have noticed. And with good reason, because today is International Lego Classicism Day (look for the #ILCD2018 hashtag on Twitter and you’ll see what I mean). Our resident CREWS office scribe was the first to get in on the act. Last week I had the pleasure of participating in the Bloomsbury Summer School in Egyptology, where I developed my reading in Egyptian hieroglyphics. It was a very rich experience, and it certainly improved my knowledge of Middle Egyptian. I wanted to do this because Middle Egyptian hieroglyphics omits almost entirely the writing of vowels. This is the same characteristic in Phoenician and Ugaritic writing systems that I am investigating for my part in the CREWS project. Detail from coffin of Khnumnakht, Middle Kingdom. Met Museum New York, Rogers Fund, 1915 (http://www.metmuseum.org/art/collection/search/544326). Legend has it that it was the Egyptian god Thoth who created writing or, as the Egyptians called it, medu netjer “the words of the gods” (this is what we refer to as hieroglyphics, after the Greek ἱερός “holy” and γλύφω “to carve”). His intention was to give wisdom and a better memory to the Egyptians, but the god Re thought that writing would have the opposite effect, making people rely on written documents for wisdom and memory. However, Thoth still gave writing to a restricted group: the scribes. For this reason, scribes honoured Thoth as their patron. The god Thoth with writing tools. 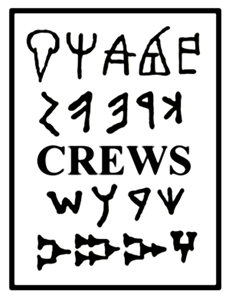 Contexts of and Relations between Early Writing Systems (CREWS) is a European Research Council funded project hosted at the Faculty of Classics, Cambridge. We are working on new approaches to the history of writing, with a focus on writing systems of the ancient Aegean, Eastern Mediterranean and Levant (c.2000-600 BC). Read more on our 'About' page. This project has received funding from the European Research Council (ERC) under the European Union’s Horizon 2020 research and innovation programme (grant agreement No 677758).